Why Do We Replace So Many Coils? Coil replacement has been a part of the HVAC aftermarket for as long as finned tube coils have been used to create heat transfer. The coils installed in the 50’s and 60’s were heavier duty than today’s coils and were almost always spiral fin type with a tension wound fin onto copper tubes. The plate fin didn’t become prevalent until the mid-60’s. By the end of the 70’s, the plate fin had taken over the market place. Another trend during the past 5 decades was the reduction in materials due to the rise in material costs. The following will review USA Coil’s “Top Ten” reasons why so many coils are replaced. Coils improperly installed – At USA Coil, we believe that 30% of all coils installed may be non- counter flow type. Therefore, the system is producing 10% to 20% less heat transfer. Coils must be counter flow. When coils are installed with non-counter flow, the number of rows in the direction of air flow create a larger heat transfer deficit. Change in application – Many systems have had their required duty changed over the years, especially in leased areas where tenants may have huge swings in required BTUH loads. Sometimes the change is small, and a change in flow on both the air and fluid side can bridge the difference. However, most times, the coil needs to be changed; because there is a need for more surface which includes an increase in rows and fins per inch and a change in circuitry. 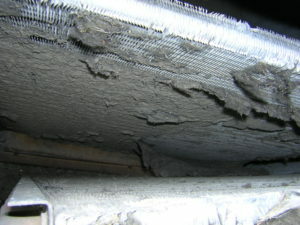 Vibration and Stress – These are very prevalent in condenser coils because moving parts of the HVAC system are near. 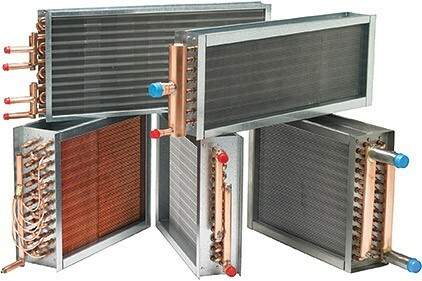 Parts such as propeller fans and compressors can radiate enough vibration to cause condenser coil leaks. Piping stress is also a factor in all types of coils, and it relates to overall piping weight and the number of piping turns at the coil connections which can cause cracks on the tubes near the tube to header joints. Project design issues – Problems can occur when the original design recommends a unit that won’t hold up to the duty and application. We see this often when a standard HVAC unit was installed in a complex industrial environment, but it required heavy wall tubes, fins, stainless steel casings, etc. Performance deficit – Many times, coils can never meet their intended capacity. It’s due to air flow and temperature issues that weren’t specified. We have seen countless units that have lower flows (air and water) and water temperatures that weren’t as specified. An example would be a unitary product at the end of a chiller system where the water temperatures to the unit cooling coil were specified as 48 degrees but needed to be 44 degrees. This can reduce the capacity by 20% or more. Adding Glycol after the original installation also creates a huge deficit and requires coil replacement. Plugged coils – This occurs due to inadequate maintenance and is often exasperated by the lack of access to the coil entering and leaving side finned areas. A plugged coil can reduce air flow significantly and can also act as an insulator between the primary and secondary surface and the air flow, which reduces capacity even further. Inadequate coil design – During the past 2 or 3 decades, light duty coils have been installed everywhere in our industry. We had the all-aluminum phase in the 80’s and 90’s and now the micro-channel design. Today most coils are packaged in units designed to fail in the first 5 to 10 years, and many coils fail just outside the warranty period. This is in sharp contrast to the coils installed in the 50’s and 60’s that lasted 20 to 30 years. Air side corrosion – The most important corrosion is a salt laden atmosphere that starts its corrosion at the fin edge where it meets the tube. When a fin is not touching the tube, heat transfer can be reduced drastically, and the white residue produced by this corrosion can reduce air flow as well. Many industrial applications have airborne contaminants that need to be addressed with a coil replacement. 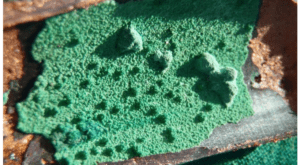 Tube side corrosion – This can happen for many reasons, but the ones that are most prevalent are 1) raw or treated water corrosion and 2) glycol treatment that can cause corrosion. Steam coils also have corrosive agents building up in the steam condensate. When condensate levels of oxygen, carbon dioxide, or ammonia rise, it eventually causes failure in copper. Coil Freeze – This is the big one! This can happen to any coil that has outside air in a cold environment. All that is required to create a freeze event is a damper malfunction or a pump to stop water flow. A freeze is nothing more than fluid in a coil that begins to lose temperature. During the loss of temperature, the fluid turns from a liquid to a solid. This phase is where the pressure inside the coil rises dramatically. The pressure rises until the weakest area of the coil splits open. This is normally on the return bends.